"Without justice, there can be no peace." --Martin Luther King, Jr. Listen to Yoruba Richen discuss what the LGBT Rights Movement learned from the Civil Rights Movement of the 1950s and 1960s. 1. 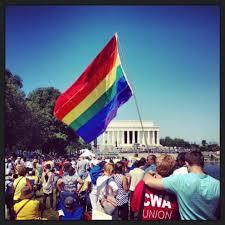 What similarities exist between the Civil Right Movement and the LGBT Rights Movement? 2. What strategies have been employed by Gay Rights Activists that mirror those used by African-Americans during the 1960s? The fight for LGBT rights is happening now. Investigate the strategies employed by LGBT Activists to create awareness and encourage key decision-makers in the country to extend the same rights to LGBTs that are afforded to heterosexuals. Photos above show LGBT Marches on Washington from the 1970s, 1990s, and 2000s. The fight for racial justice in America's schools, in the workplace, and in society is happening now. Below you will find strategies employed by individuals and organizations around the country to secure a brighter future for people of color in the U.S.
Across the United States, low-income black children's isolation has increased. It's a problem not only of poverty but also of race. The share of black students attending schools that are more than 90 percent minority grew from 34 percent in 1989 to 39 percent in 2007. In 1989, black students typically attended schools in which 43 percent of their fellow students were low-income; by 2007, this figure had risen to 59 percent (Orfield, 2009). Integrating disadvantaged black students into schools in which more-privileged students predominate can narrow the black–white achievement gap. School integration, both racial and socioeconomic, can complement improvements in students' early childhood care, health, housing, economic security, and informal learning opportunities. Women have made great strides toward equality over the past decades, yet gender bias continues to hinder women in the pursuit of employment, in the sales and rental of housing, and in the daily pursuits of education, health services, and more. Today, women make 77 cents to every dollar that a man makes, and in recent ERC tests conducted of a home sales company found that 60% of the time women were required to make a higher down payment than men when purchasing a home. Women continue to face harassment by their employers or fellow employees, and by their landlords. And women face unfair and illegal treatment – in the form of firings or refusals to hire – when they are pregnant.